A petrologist and mineralogist by training, my research has focused on the study of the material components of the early solar system (i.e., meteorites) utilizing electron microscopy (SEM, EPMA, TEM, SXRF). My M.S. thesis details my studies of glasses in howardite meteorites from asteroid 4 Vesta, where I argue that the glasses are impact melts rather than pyroclasts. These findings contrast with studies of the moon, where pyroclastic glass beads are common, arguing for different volatile inventories between the two bodies. My Ph.D. dissertation summarizes my studies of iron sulfides in CM and CR carbonaceous chondrites. Throughout the work, I provide evidence for a primary (nebular) origin for the sulfides contrary to previous studies which argue for a secondary (asteroidal) origin. In both my M.S. and Ph.D. research, I aimed to determine how and under what conditions these material components formed to better determine how the solar system has evolved over time. My current research involves analysis of the minerals industry utilizing production, consumption, and trade data with the U.S. Geological Survey's National Minerals Information Center. Our center collects and analyses these data, essential for the U.S. economy and national defense, to better inform policymakers and members of the public. I am the bismuth, platinum-group metals, and strontium commodity specialist. I am also involved in several special projects related to the minerals industry. 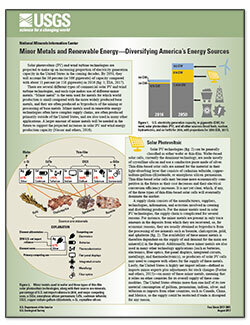 Singerling, Sheryl A.; Nassar, Nedal T.
Singerling, S.A., and Nassar, N.T., 2017, Minor metals and renewable energy—Diversifying America’s energy sources: U.S. Geological Survey Fact Sheet 2017–3061, 2 p., https://doi.org/10.3133/fs20173061. Glasses in howardites: Impact melts or pyroclasts? Singerling, S. A., ModiI, A. L., McFerrin, B., Worsham, E. A., McSween, H. Y., Rumble, D., Tanaka, R. and Taylor, L. A. 2013. Two new eucrite breccias from Northwest Africa. Meteoritics & Planetary Science 48: E1–E9. Singerling, Sheryl A., "Studies of Regolithic Vestan Samples: Brecciated Eucrites and Howardites." Master's Thesis, University of Tennessee, 2012. Tuck C. A., Xun S., and Singerling S. A. 2017. Global iron ore production data; Clarification of reporting from USGS. Mining Engineering 69(2): 20–23. Singerling S. A. and Brearley A. J. 2018. Primary iron sulfides in CM and CR carbonaceous chondrites: Insights into nebular processes. Meteoritics & Planetary Science 53(10): 2078–2106. Singerling S. A., Burkemper L. K., and Sharp Z. D. 2018. Measurement of adjuncts in hard ciders obtainable in the United States using carbon isotopes. Journal of Agricultural and Food Chemistry 66(43): 11422–11425.